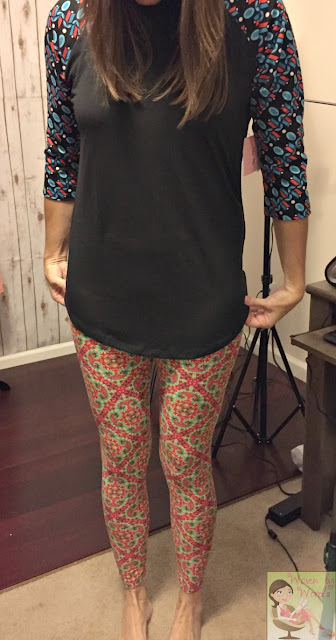 A couple months ago I was introduced to LuLaRoe leggings. I had heard about them about a year ago, but gave them the side eye because I didn't know what that was about. Leggings...Then I had my first opportunity to feel them. hahahaha I know, you're thinking that makes no sense because...leggings. My associate pastor's wife had them on at church, and she told me to feel them. They felt like butter! I just wanted to keep petting her. I was so disappointed I had missed all the hullabaloo the months prior that I'd been giving them the side eye. Then I got my first pair. Pretty much didn't want to take them off. They're incredibly comfortable, and so soft! Now, you might see some incredibly wild designs and patterns, but that's not all they have. hahahaha I've done subdued ones so far, but hey, that's from someone who has always avoided anything with patterns or designs! LuLaRoe just brings that out in you! 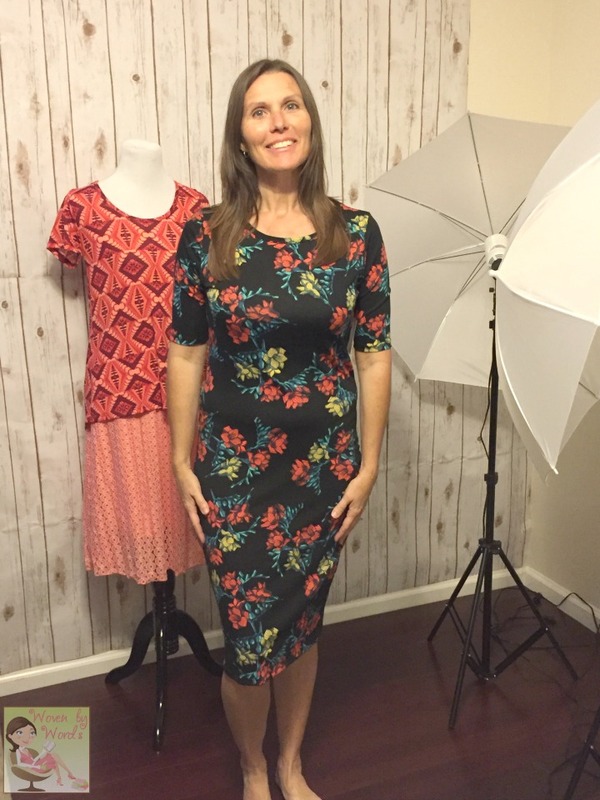 A couple weeks ago, before we headed out of town again, LuLaRoe Fashion Consultant, Jean Lowd contacted me to see if I'd be willing to do a review! hahaha THAT was a no brainer for me! 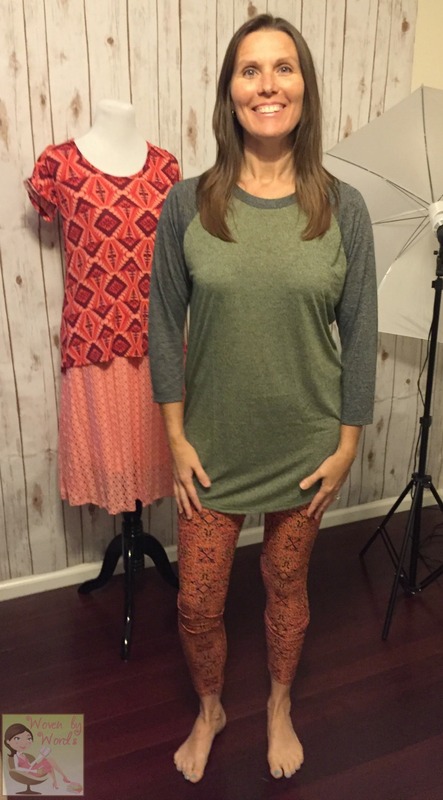 What I had been learning about LuLaRoe is that they are now much more than just leggings! They've been building their line, and have introduced so many new styles. Styles I got to try on at Jean's house while my hubby played photographer! 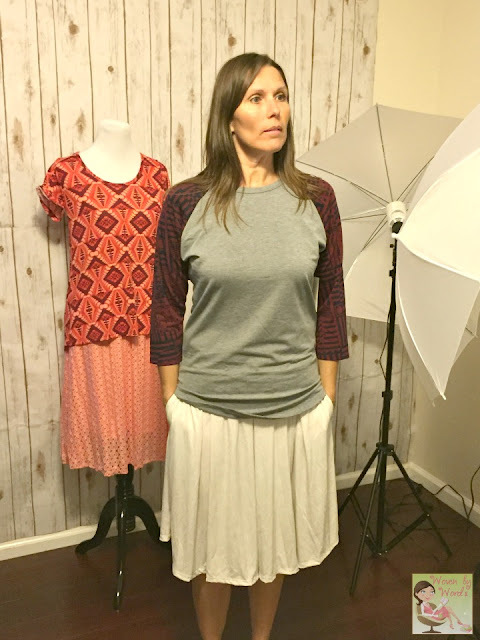 Today I was going through all of my photos, and had to compare them to what was on the LuLaRoe site to make sure I was getting the names of the pieces right. I was shocked to see how many styles are on the site that Jean didn't have yet. If I actually start exercising, I'm definitely checking out the Jade and Jordan! They've also got 3 styles for men in their shirts, and one shirt style for boys. Girls have a fun selection that are similar to the women's line! The cuteness is to die for! Another reason I'd love to have another little girl to dress up. So let's check out the fun styles, shall we? This dress is the Nicole. It's got a fitted top and a full skirt! 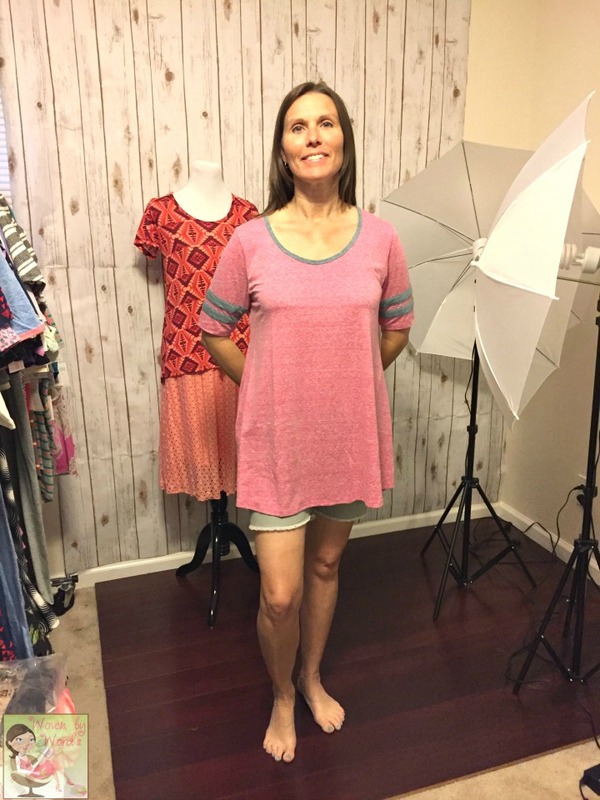 I liked the length of the sleeves, and how great it felt on me! It was super feminine. I liked the Julia, but it was a little more fitted than I'm used to. It has the same sleeves as the Nicole above. It's a knit fabric that's one piece from top to bottom. 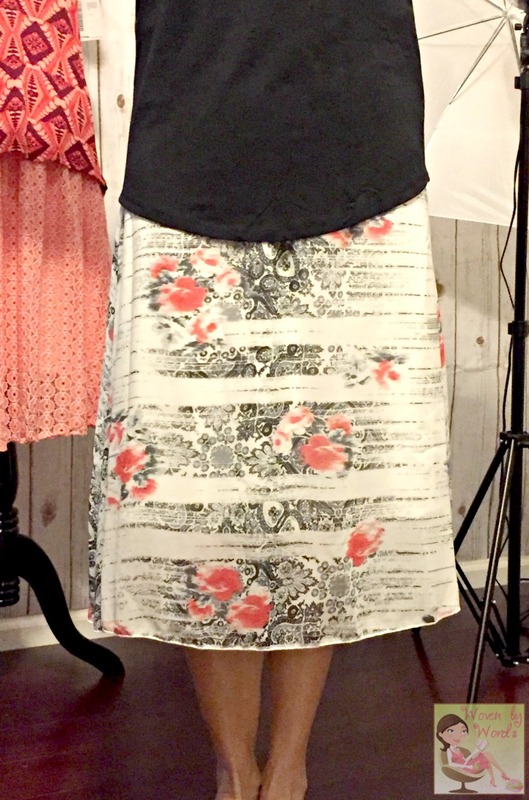 The Nicole above has a seam around the waist. This is the Azure skirt. It's a knee length skirt with a wide waist that allows you fold it over like your favorite yoga pants. The Azure is a light, flowy skirt. You could have a lot of fun with mixing and matching these with different tops! Then there's the Cassie. It's a pencil skirt that fits fabulously. I actually loved this skirt, but Fred wasn't a fan. Glad I wasn't asking his opinion! HA! This one had not only a design, but there was a texture that you can't see from the picture. I think if I had a plain, white long skirt, I'd wear this style a lot! 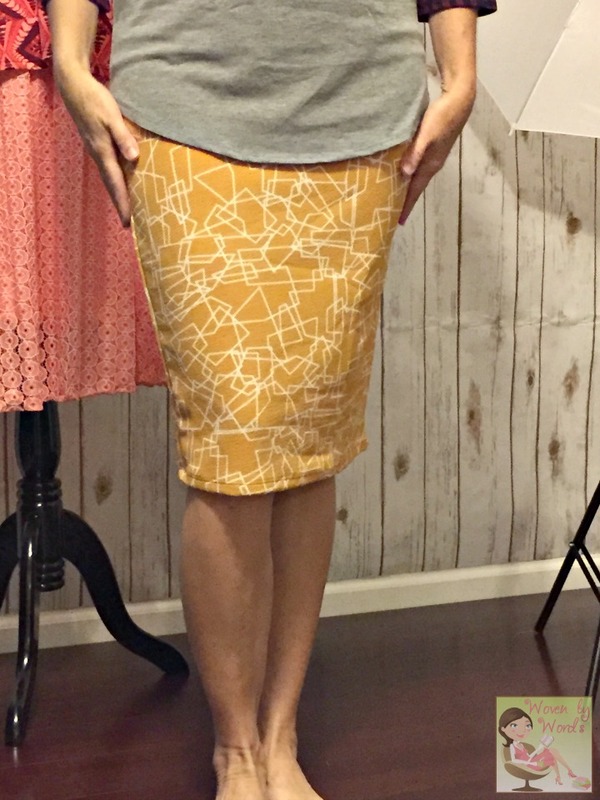 Ok, so the next skirt is the Madison. 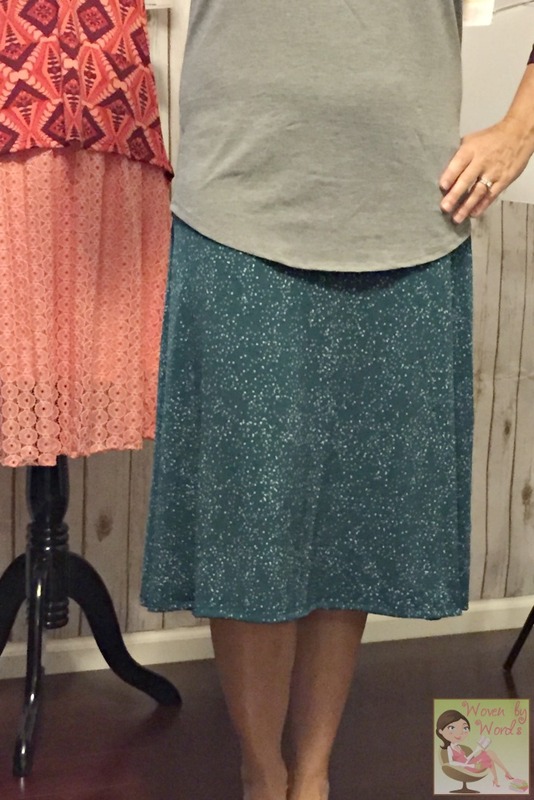 This is the skirt that has pockets! Yes, ladies, it has pockets! 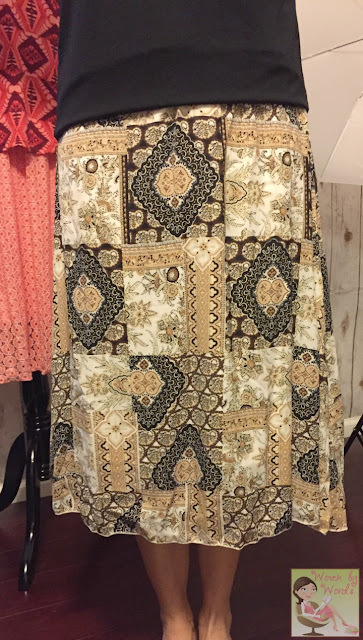 This is one of those skirts you can just relax in or wear to work. It's super versatile! Put on a dressier shirt than what I had one, and it would definitely work for a professional, while remaining very comfortable! Ok, can we talk about the shirt I've been waiting to get for a couple of months? It's called the Randy. I fell in love with the style when I saw it the first time. It's a unisex shirt that's like the old school baseball T. I was such a tomboy when I was younger (ok, still am) that I always wanted, but never had this style. Well, that is now over! I'm wearing one of the designs in the above photo, but this is the Randy I took home with me! This one is really cute, too! Sometimes the body of the shirt has the design, other times it's the sleeves. 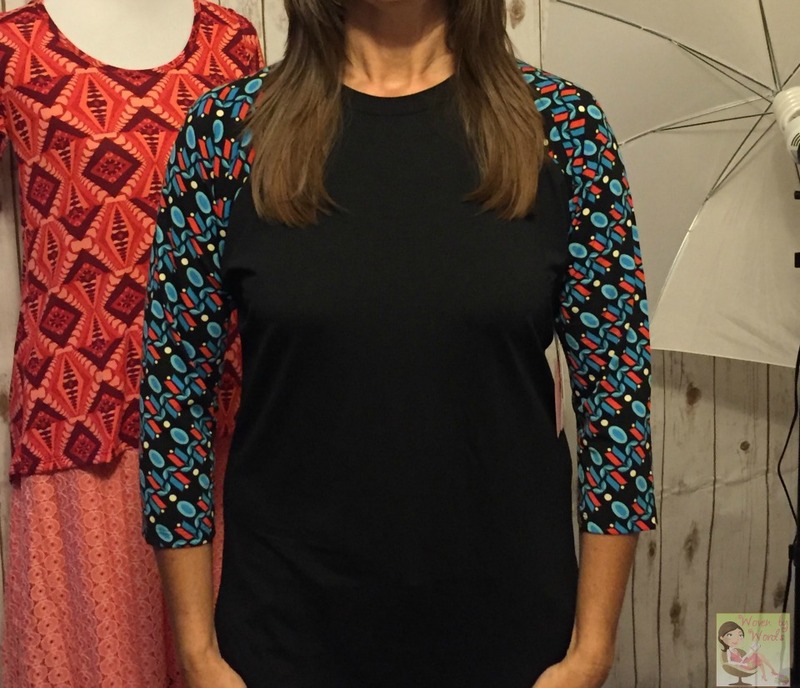 The one below had no design, the sleeves and body are both solid colors. I like the different sizes, too! The Large is great to wear around like a pajama shirt, while the medium I'd wear with my shorts when I'm out and about. The leggings in the first picture below are the pair I took home with me! I'm kicking myself for not getting the pair in the next one. This shirt is the Perfect shirt. It's "perfect" for any outfit, but specifically leggings because it covers your behind. I really loved it with my shorts! You can tell just by looking at it that it's super comfortable. The sleeves I love! Now I didn't try on a lot of the layering pieces like this Lindsay. I think this piece would be great to relax in or just add as an extra piece to your favorite outfit. You just want to wrap yourself in this kimono. Now, the designs you see above? If you blink you may miss it. That's one thing LuLaRoe is known for. If you want a design, you better buy when you see it or you may never see it again! lol That's their golden ticket! They only make a certain number of each design, and that makes them highly sought after. I'm looking forward to the holidays because they will for sure have designs that everyone will clamor after! I missed the ones for 4th of July, and now I'm kicking myself! I'm not going to make the same mistake with the holidays coming up. I want to thank Jean for the opportunity to try on so many fun pieces! When we were heading out, she gave me her business card, and this is the first time I've seen a consultant have one where if you buy 10 items, you get a free pair of leggings! Oh, boy, this could happen very easily! 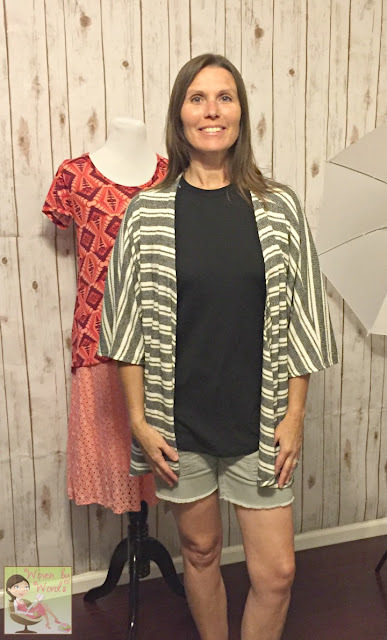 Be sure to join her LuLaRoe VIP Facebook group so you can stay on top of the newest designs and the styles she gets in! If you're in Maryland, you'll have to keep up with her pop-up boutiques. That way you can have as much fun as I did! Have you ever tried on LuLaRoe leggings? Great picks! I like that floral dress!